I think that nature photography is a gateway drug to a healthy wildlife watching addiction. With that hypothesis, I’ve been enjoying how many social media sites I frequent daily are now heavily populated with images (cough… Facebook, Google+, & Tumblr). You can’t go anywhere on those sites without bumping into a few words slapped on to a startling picture. For this reason, I’ve been keeping my eye on Instagram– mostly because this simple site has seen a growth in users and has a healthy number of compelling wildlife and nature photos. It’s a simple concept- upload your photo, add a filter, and share with your friends. I recently read an article that said 40% of brands were also on Instagram. Now that they’ve added Photo Maps, I’m intrigued by what this means for documenting experiences using Instagram and how this can enrich your experience when you visit the natural world. 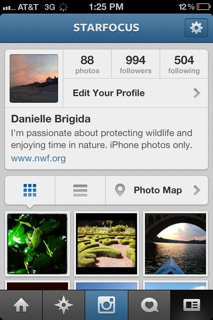 I haven’t created a profile for NWF, mostly because we get a lot of user submitted photos but don’t have a steady supply of the wildlife photos that would be most interesting to people. But I do see great examples of Instagram use, and I continue to be curious about the platform. There are also awesome fun things to search like #skyporn, #macromonday, and many many more! So if you’re tagging photos with hashtags and you aren’t being descriptive– try and remember to be just that. Are you using Instagram? Let me know! Thanks for the list of photo apps, it will give me some good inspiration!